The latest brainwave from the besieged music industry is the proposal to offer free music to end users via the Total Music brand. Spawned by Universal Music, Total Music looks likely to sign the big four record labels and a range of smaller firms as well, with Sony BMG on board and Warner Music looking as it will be as well. Free is the ultimate selling point in market side economics, because ultimately you can’t beat the opportunity cost of zero. But here’s the catch: Total Music may market itself as offering free unlimited music, but it’s not really free, the cost is just hidden. That cost: $90 per device for access to Total Music, based on $5 per month over 18 months (the figures Universal are using). In our above example Microsoft has decided not to absorb the $90 Total Music charge but has instead added it to the price on the 4gb Zune, taking the total price to $239. Which would you buy? 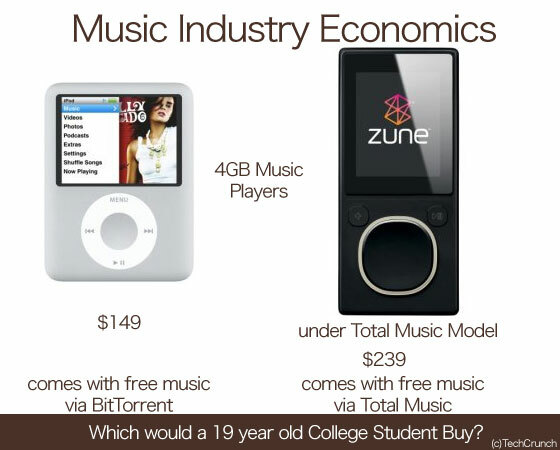 In the Zune example Microsoft may embrace the Total Music model and subsidize the subscription costs. Say that Microsoft split the difference and the Zune went from $149 to only $194, it’s a better figure but it’s still $45 more that the iPod. Could Microsoft absorb the whole price? Unlikely; after all why would it willfully hand over $90 of a $149 product, which we presume would certainly destroy Microsoft’s product margin on the Zune, and could even make each sale a loss. I’ve used Microsoft as an example but it could be any company with a music player that isn’t Apple . Universal is looking at targeting anything that plays music, so aside from MP3 players you could be seeing this hidden cost built into mobile phones, media streaming devices and perhaps even computers. I should note that some people like their music legal and will pay a premium, but given a $90 price difference this is unlikely to be a majority of buyers, particularly when the iPod offers legal options as well, options that are a choice and not an imposed upfront cost to the buyer. The music industry may talk about free music, but all it is doing with Total Music is shifting the point in which the consumer pays to one that isn’t nearly as transparent as iTunes.